Camp Bow Wow Delaware North dog training services are specially designed to enrich your pup. Our premier dog training services offer flexible programs for every dog. The training methods we use are designed using only reward-based techniques to ensure your pup has the most fun learning experience. 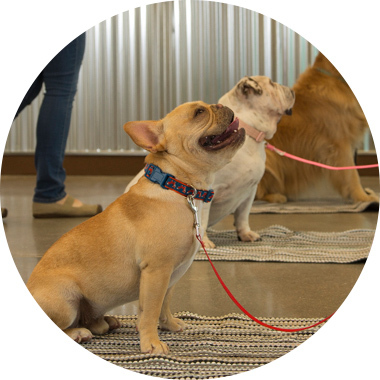 Our programs are exciting, effective, and enrich canines of all ages and behavior levels. 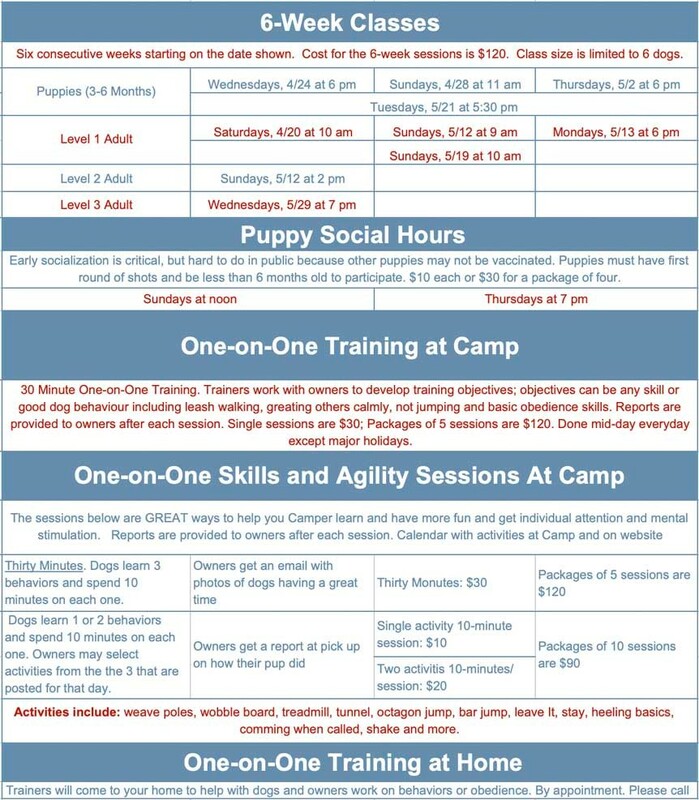 One of our Camp Bow Wow Certified Trainers will work to design a program that meets your needs and your schedule. Contact Camp Bow Wow at (302) 738-2267 to schedule a session! We also STRONGLY RECCOMMEND THE CANINE INFLUENZA VACCINE. Please ask your vet about this important vaccination of get it at our monthly vaccination clinics for $30/dose. Our dog training obedience classes are split into levels to help you and your dog learn at a progressive pace. Our classes will help you create the well-behaved dog you have always dreamed about using only reward-based training methods. A 25% deposit is required to hold a spot for all group classes. This is fully refundable if owner cancels at least 48 hours before the class is to begin. Builds the foundation of reliable commands like sit, down, leave it, come when called, and leash walking. Learn how to get your dog to heel by your side, go to their mat, and add distance plus distractions to all their behaviors. This level teaches your dog to sit when you greet a stranger, heel in a crowd, and more. They will now be prepared for the Canine Good Citizen (CGC) exam. Our tricks class is great for teaching your dog some fun stuff you can show off to your friends, and your dog will love it, too! Teach them to spin and twirl, crawl, bow, shake and more. This is also a great class for kids to interact with their pup in a fun way. 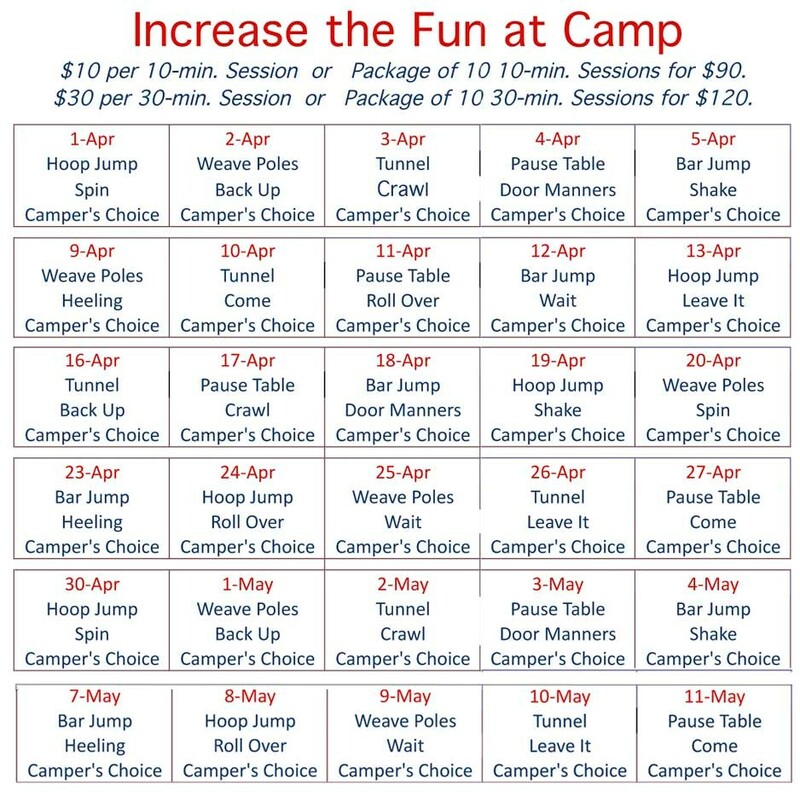 - One on one fun for your Camper with our training staff. - Activities for Skills and Agility include: Bar jump, Weave poles, Hoop jump, Roll over, Leave It, Pause Table, Spin, Shake, Door manners, Crawl, Back-up, Heeling and more! Done in early afternoon. - Owners may select 1 to 3 activities each day. 10 minutes/activity. $10 per 10-min. or Package of 10 10-min. sessions for $90. $30 per 30-min. session or Package of Five 30-min. sessions for $120. *Pricing does not include daycare or boarding. Let our Certified Dog Trainers work with your dog while they are at Camp. With our Play & Train and Board & Train options, our Certified dog trainers will spend 30-minutes of one-on-one time with your dog during the day. Your trainer will recommend how many sessions your dog will need to learn the desired behavior, and you can pick up a well-mannered dog! Our Certified Dog Trainers will work one-on-one with you and your dog in a private setting that is most comfortable for you and your family. Private training can help you with addressing basic behavior issues, obedience or more serious issues. Safety is our first priority. To make sure we keep dogs safe all private training clients are required to complete a Dog Safety Sheet so we can avoid any potential unsafe situations and situations which may stimulate dogs in our care. Please complete this sheet and give it to the person doing your initial consultation. Thank you for your cooperation in keeping your dog safe. Call us today (302-738-2267) to talk to our Certified Dog Trainer and see how we can best help you with your training needs. 6 week class. Dogs 3 - 6 months. Basic manners and behavioral issues. All puppies taking part in Puppy Classes or Puppy Socialization must have had DHPP (a combination vaccine for distemper, adenovirus [hepatitis], parainfluenza, and parvovirus) and bordetella at least one week before coming to Camp Bow Wow. Owners must also bring verification of a second set of shots for both DHPP and bordetella within 5 weeks of the original vaccination. All dogs at Camp must have a rabies vaccination when 4 months old. 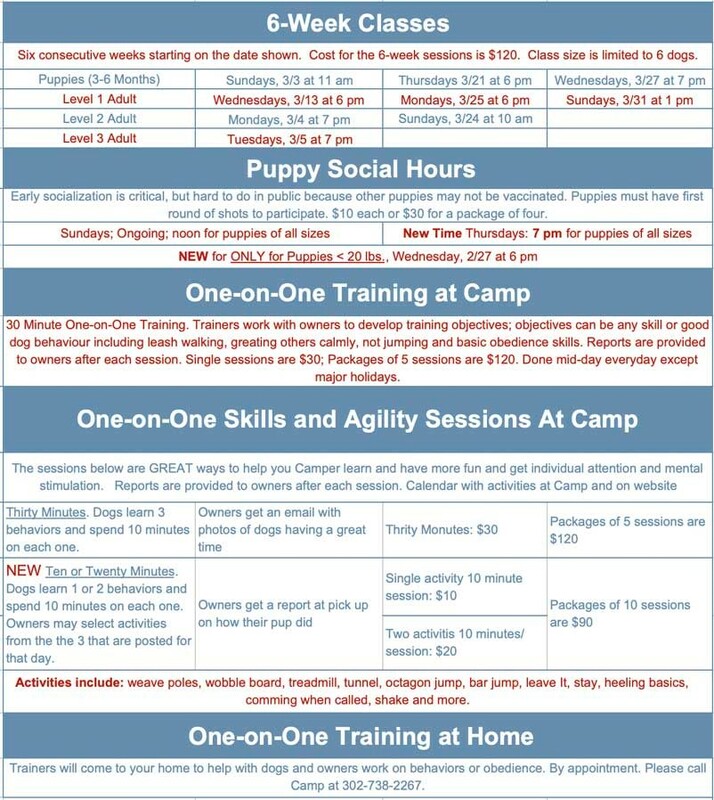 30-minute training session while your pup is at Camp Bow Wow. Prices do not include daycare or boarding. Campers attending in-Camp training must first pass our initial interview process. Owners may select which behaviors they would worked on. These may include stay, walking on leash, jumping or other basic training behavior. Package of five 30-minute Play & Train sessions for 1-on-1 training while your pup is at Camp. Price does not include day care or boarding. 10, 20 or 30 minute sessions. Your pup will spend 10-minutes with a trainer on each behavior. 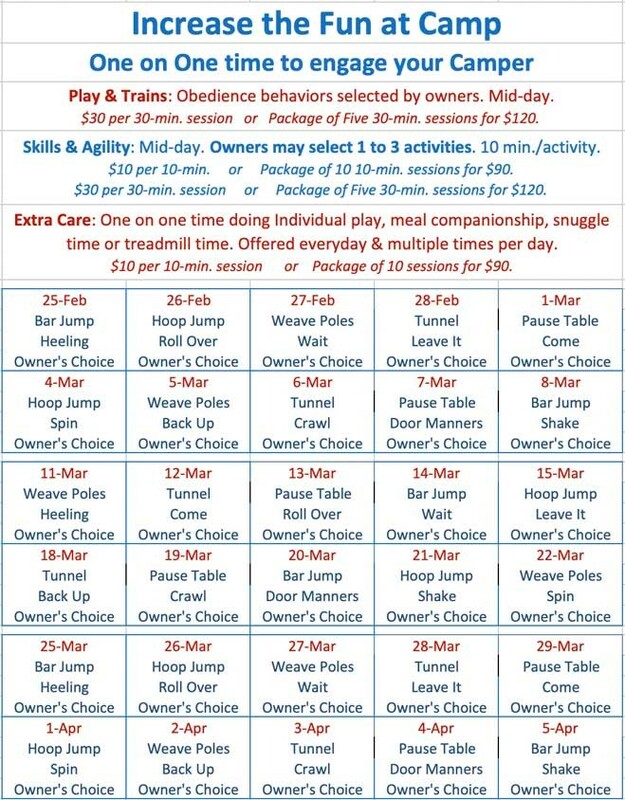 Three behaviors will be covered in each session and owners may pick any or all from the behaviors listed for that day. Behaviors taught will vary so dogs can participate and learn every day! Topics will include: Leave It, Back up, Stay, Heeling, Roll over, Coming when called, Shake, Spin and Crawl. Dogs will spend 10, 20 or 30 minutes with trainers having fun with weave poles, wobble board, treadmill, platform, tunnel, jumps, etc. $10 per 10-minute session. Owners may pick any or all from the three Agility for Fun topic list for that day. Package of five 30-minute Circuit Training sessions. Each dog will spend 5-minutes with a trainer on one behavior, and then 5 more minutes with another trainer on same behavior. Three behaviors will be covered in each session. Behaviors taught will vary each week so dogs can participate and learn every day! Topics will include: Leave It, U-turn game, Back up, Stay, Heeling basics, Roll over, Coming when called, Shake and more. Package of five 30-minute agility sessions. Dogs will have fun with weave poles, wobble board, treadmill, tunnel, and more. 10-minute Circuit or Agility for Fun sessions. Trainer will work with dog at Camp for 1 hour on objectives that have been pre-set by Owner and Trainer. Vaccinations required. Trainer will work with dog and owner for 1 hour on objectives that have been pre-set by Owner and Trainer. Seminar topics to be announced. Sessions are for owners. Dogs are not present for seminars. Puppies under 6 months of age gather to play and learn some basic manners. All puppies taking part in Puppy Classes or Puppy Socialization must have had DHPP (a combination vaccine for distemper, adenovirus [hepatitis], parainfluenza, and parvovirus) and bordetella at least one week before coming to Camp. Owners must also bring verification of a second set of shots for both DHPP and bordetella within 5 weeks of the original vaccination. All dogs at Camp must have a rabies vaccination when 4 months old. We will host 1 hour workshops on training topics like leash pulling and jumping. ASK if you'd like us to have one on a topic you are interested in!